Great Cajon, wonderful addition to my collection! I own several cajons (8 now I believe) from different companies. This is my second Sela and it does not disappoint. Cosmetically I love the look of it, the black body and dark faceplate are stunning, most importantly it sounds awesome. The hard splash front plate definitely provides a deeper bass tone than the standard sela tapas, however, it does not significantly take away the snap of the snare (especially if you install 2 snare units in the drum as I have done). I have not used it in a live situation yet but will do so this weekend. 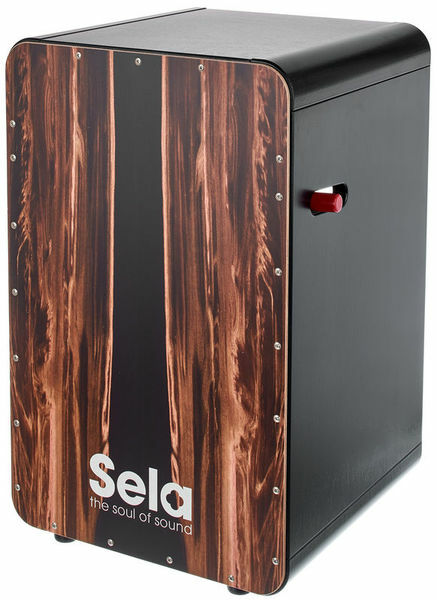 I have no doubt that it will perform perfectly as my other Sela cajon has for quite a while. This is a great product. Fit and finish is superb along with the sound quality- love the snare on/off mechanism (best in the business as far as I am concerned). It's a wonderful instrument! I played a few and none had the presence and tonal balance as right as this one! The lever is smooth and very practical, specially if you are looking for different tones on the percussion. It really enhalts your sensivity for the music! The round corners on the top make it easy on the legs! You literally can play on it for hours with little fatigue! ID: 414319 © 1996–2019 Thomann GmbH Thomann loves you, because you rock!